Base of Operations: "A deserted amusement park on one of New York's many famous beaches"
Powers/Abilities: El Diablo could project his thoughts and mentally dominate an individual, forcing him to do his bidding. 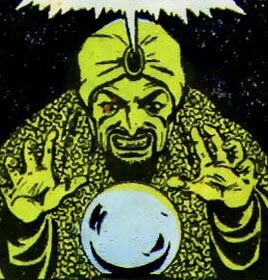 By gazing into a crystal ball, El Diablo could remotely view distant events. History: (Sub-Mariner Comics#39/4 (fb) - BTS) - "Some years back," the Sub-Mariner captured fugitive Andre Lear for the police; Lear was later executed as a convicted murderer. Lear's brother (and only living relative) swore to get his revenge on Namor, and spent years developing his talents to become the world's greatest hypnotist. He then set up operations in an amusement park, where he was known as "El Diablo." (Sub-Mariner Comics#39/4) - When the amusement park shut down for the season, everyone connected with the park assumed El Diablo had gone to Florida. But one cold winter night, El Diablo returned to the abandoned park and to his exhibition building. 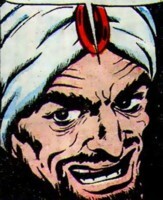 Seeing in the newspapers that the Sub-Mariner was in the vicinity of New York, El Diablo began his scheme for revenge. 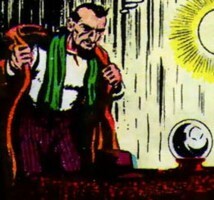 Sitting before a crystal ball, El Diablo projected his thoughts, summoning the Sub-Mariner to him -- his mind dazed and foggy, Namor was unable to resist. Seeing that the Atlantean prince was completely in his power, El Diablo sent Namor to a nearby bank. The Sub-Mariner was compelled to break into the building and fly off with as many bags of money as he could carry. After taking the loot to El Diablo's hideout, Namor was ordered to steal from one of New York's most exclusive jewelry stores. The Sub-Mariner's crime spree went on as the succeeding weeks turned into months. By the time spring approached, the entire city was up in arms over Namor's brash, arrogant pillaging of its public and private wealth, and the police were powerless to stop him. As he gloated among his amassed riches, the diabolical El Diablo summoned his amphibious puppet before him for one final mission. Now that Namor was thoroughly enmeshed in a life of crime, El Diablo reminded him about his brother -- El Diablo had never forgiven Namor for his brother's downfall, and wanted him to share his brother's fate by committing the same crime. After being given specific orders, Namor flew off and saw a lone policeman patrolling the boardwalk. As the hypnotized Sub-Mariner advanced upon his prey, the cop fired several shots, to no avail. But when Namor grabbed the cop and was about to strike him, the shock of committing such a sordid crime so completely foreign to his nature snapped Namor out of his trance. While Namor flew back to the amusement park, the cop raced to a call-box and summoned reinforcements. Meanwhile, alone in his hideout, El Diablo gazed into his crystal ball, saw the misty image of Namor flying back, and realized his spell had been broken. Panicking, El Diablo dashed from his dismal headquarters and raced down the midway. Glancing over his shoulder, the evil hypnotist saw the Sub-Mariner hurtling from the heavens. El Diablo ran into a house of mirrors and temporarily lost his pursuer, but Namor merely smashed his way out and saw the malevolent mystic running towards the roller coaster -- the villain threw the switch and jumped into the first car (see comments). Just as the police reinforcements arrived, the Sub-Mariner flew to the roller coaster as the cars climbed to the top of the peak; unused for months -- rusty and ungreased -- the cars ran off the tracks. The Sub-Mariner flew up and grabbed El Diablo, saving him from plummeting to his death, then ordered him to tell him where the stolen loot was hidden. El Diablo indicated it was all in the Tunnel of Mystery boat ride. After flying him inside, Namor dropped El Diablo in the water, then pulled the ceiling at the end of the tunnel down to trap him inside. Namor then ordered El Diablo to make a full confession to the police. After seeing his former mental master taken into custody, the Sub-Mariner flew off, thankful that his long, long night was finally over. For the benefit of any readers who failed to understand the utter futility of El Diablo fleeing via a roller coaster, see the profile on the Beatles Imposters to learn why this method of escape never works. And a BIG Thank You to Atlas Tales for getting me the scan of this story!